I just finished re-reading Dr. Dement's The Promise of Sleep, which was good since I needed to learn different things from it now than when I last read it several years ago. I highly recommend this book to pretty much everyone, since I agree with Dr. Dement that sleep is one of the least understood but most important aspects of our physical and emotional health. The quality of your sleep affects so many other parts of your life. What prompted this re-reading for me was coming back from my vacation last month with a severely screwed up sleep schedule/ability. Between jet lag, dance camp, Harry Potter, and various kinds of stress, I was a wreck. I had three days in a row at one point where I only slept a scattered handful of hours, and even after that I'd have nights where I was exhausted but unable to fall asleep for hours. Then I'd alternate nights of no sleep with nights of sleeping like a rock. So I started experimenting a bit with my sleep schedule (what did I have to lose at that point?) and also started reading this book to see if what I was doing made any sense. Luckily it did. The downside to this, of course, is feeling sleepier than I'd like during the day. In the current phase of the plan, I'm alternating nights again, but in a much less dramatic way than when I had no control over it. I just switch between staying up the extra hour or not, so it's not a huge difference, but so far it seems to be balancing well between getting more rest and still falling asleep without too much trouble. There's also the plus that I can time my later nights so that I get more dancing (like the fact that I actually stayed at FNW all the way to the end last night). This does go against the standard advice of maintaining a rigidly consistent schedule of sleeping and waking, but Dr. Dement does stress in the last chapter of his book that it's really just important to understand the principles, and that different things will work for different people. My original idea was to eventually work back to having a fixed schedule, but I'm starting to reconsider this. If this alternating pattern continues to work out well, I may just tweak it a bit to make sure the total sleep time is enough, but then leave it there. We'll see. Another thing I've been doing -- independent of but beneficial to the sleep times experiment -- is working out and running more. Dr. Dement recommends regular exercise as being good for sleep, but adds that it's best to do it more than 3 hours before bedtime, so as not to keep you awake. This is another case, though, where it's important to really understand how I personally react to it. My favorite time to go running recently has been about 10 PM. Luckily, this not only helps tire me out, but it can be incredibly relaxing. Running is very meditative for me. Nowadays, my mind -- my sleep nemesis -- is never as calm as when I'm running. And when I'm done and cooled down, I can continue relaxing myself for a while afterwards and maintain much of that feeling until I'm ready to go to sleep. So for 3 or 4 nights a week, that's very helpful. Danny - Most all-around beautiful dancer. Probably just didn't engage the audience enough to win. Sabra - Like a little sprite. Always fun to watch. Neil - Didn't care for him at first, but it got better. Gotta love the leaps, though, and that plange over Sabra on the table. Lacey - Performed too explicitly. Hard to relate to her as a real person because of it. Lauren - Took me a while into the season for her to grow on me, but she certainly did. I can really feel how happy dancing makes her. Pasha - I liked him a lot, but he didn't need to be going all Dimitry-shirtless on us all the time. Sara and Dominic - I was consistently amazed at how incredibly well the two breakdancers picked up all the partnering stuff. Hok - I had huge hopes for him early on. He did my favorite solos but could never quite cut it on the partner dances. Sigh. As for the choreographies this season, I was less consistently impressed with them than I was last year. There was nothing on the same gorgeous, memorable level of Ivan and Allison's hip hop, or Travis and Heidi's contemporary. There were a few good ones, though. Neil and Sabra's "negotiating" jazz dance was really good, and I enjoyed Lacey and Sabra being foxes much more than any of the judges did. I also liked the Wade Robson solo that everyone did individually several weeks ago. (And I appreciated the opportunity to make that kind of a comparison between contestants as well.) There were some others that I enjoyed re-seeing during the finale, though they hadn't made a huge impression on my the first time around and probably still won't be too memorable. I was excited to see the first Lindy Hop on the program ever, though it seemed pretty low energy. Hard to blame them, though, since they've got to be worked to death at this point, plus it was an incredible amount to learn in such a short time. Last night I went to a Swing Kids "Jasmix" (I think the "s" is for "summer") on campus, and I have to thank two people for making me glad I stayed awake all the way to midnight: Jason for the last waltz he played, and Rachel for dancing it with me. Three people, perhaps, since I'll extend the gratitude to Vienna Teng for writing and recording "Recessional" on her latest album. In spite of it not being a cross-step, it's my new favorite last waltz. The magic of this song is in how you have to let yourself be completely and utterly absorbed in it. While we were still nominally leader and follower, the only way to really dance to this was to both be followers of the music. The fluidity of the tempo changes, the fermatas, the pulses, all prevent you from letting your attention stray for even an instant. But the closeness and intimacy of it draw you in to the point where you don't even want anything other than to be a part of it. The incredibly restrained vocals especially give the impression of hearing her heart speaking directly to you from inside her chest. You not only have to listen to it, but to really feel it and experience it, to "breathe with it" as Jason said, so that it's flowing through you. Ending the dance was like waking up and having to come to terms with the real world again from scratch, though we'd only left it four minutes ago. Vienna Teng has described "Recessional" as a sort of reverse emotional strip tease. It begins at the most open, raw, touching point, and slowly covers itself back up. It took me a few listens today, though, before I realized that it's still chronological, and not going backwards in time. The music helps show that, and once I realized what was going on it made the song even more intense and poignant. The emotional effects of this song have stayed with me most of the day today. A friend passed on the following advice from their psychiatrist: Practice giving 50%. In a world of 110% expectations, that sounds kind of silly, but here's what it means. Some people have a tendency to completely throw themselves into a relationship (friendly, romantic, whatever) 100%. This isn't in and of itself a bad thing, especially if they're around lots of other people like themselves. But it can get to the point where such a person meets too many "zero percenters" and they become primarily responsible for the majority of the relationships in their lives, and everything that makes a relationship "work" depends on them. Even for people who are inherently relationship-oriented this way, this can become a huge pressure and a burden. So you practice giving 50%. Practice letting other people meet you halfway and appreciating that balance. I've been thinking a bit about how I relate to this. I sometimes feel like I tend to be very much at the extremes: you get all or nothing with me. Maybe not nothing nothing all the time, but there's definitely a gap in the middle. Odd, since in so much of my life I strive for balance and a happy medium. But it's true that I have very few good friends, and lots of acquaintances. And there are even a great many people whom I quite like but that I don't really feel as close to as might make sense. So for me this advice would be geared more towards having a wider range of relationship types. Good for quality of life in general, I think, but also as a cushion of sorts if anything goes awry in one of the "100%" areas. I think I'm kind of taking the percentage concept in a couple slightly different ways here, but it's an interesting one to mull over and apply in different ways. On Sunday, Mom invited me over to Ananda to to see Swami Kriyananda. It was the last talk he was giving in America on this trip before going back to India. He was a direct disciple of Paramhansa Yogananda over 50 years ago, is probably as close to enlightenment or self-realization as anyone alive, and he also founded Ananda communities around the world, so it's like having a living saint come to visit. I've been immensely inspired by him just from reading Asha's book, which is a lovely collection of short stories and memories about him from all sorts of Ananda-affiliated people, so I was very glad to get to see him. 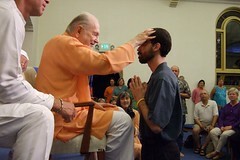 Swamiji is inspiring because he represents so intensely the qualities I want to find and develop in myself. No matter what situation he's in, he just absolutely exudes complete love and joy with every particle of his being. It doesn't matter that he's in his 80s, with his health and body falling apart; he just carries on joyfully letting God work through him and loving everyone around him. If you meet him for the first time and only spend 10 seconds with him, he can still make you feel like the most important, beloved person in the world. It's the most beautiful and powerful kind of personality I can think of. The talk was gentle in presentation yet intense in content. Many things I believe in and want to strive for, and many that seem frighteningly unattainable. But after the talk was when we had the opportunity to actually greet Swami individually, and that, I think, would make the day worthwhile all on its own. For an hour, people queued up to each get their own few seconds in front of him, to introduce themselves, look into his eyes, and feel his touch as he blessed them. I have to admit that I was kind of nervous and self-conscious going up there for the first time, and I almost missed it through my own distraction, but the feeling was still intense. I don't know what to call it. It wasn't any one of the extreme, specific emotions I've been experiencing recently, but more like pure, and nameless, emotion. I moved to the side and cried quietly for a while, not because I was explicitly sad, but because it was the only way to gently let the feeling move through me. I watched the river of people continue to flow blissfully along in front of him, and the baby whose crying turned to giggles when Swami touched his head. As the stream turned to a trickle and the end of the line came near, I spent a little while screwing up my courage, then added myself back into the queue. When I was back in front of Swamiji again, I admitted that I'd been through already, but this time wanted to ask for a blessing for someone far away. He very graciously said yes, of course, and as he put his hand on me, I spoke the name of the person with whom I wanted to share this experience. I don't know if I was more conscious this time around, or if I was trying more deliberately to channel the energy, or if it was just from going through a second time, but the nameless mystery emotion was even more powerful than before. It was a while before I was able to come back and focus enough to drive myself home. If you're interested, the Ananda website has and audio recording of this talk (with video probably coming too), as well as many others. It's not the same as being there, but it's good stuff regardless. I also recommend Swami's reading of a P. G. Wodehouse story.